Very few customers are loyal to companies who don’t have an online presence, a study conducted by Valoria shows. Only 4 percent of consumers are very loyal to a company that does not have an online presence, while 33 percent are loyal to a company with online presence. 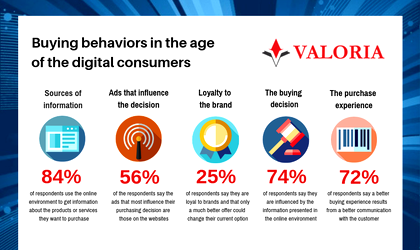 The study “Buying behaviors in the age of the digital consumers” released by Valoria shows that most of the consumers who are very loyal to the brands that they currently purchase are those with an income of up to EUR 500 (20 percent). Of the consumers who say they would change their current brand with a competitor if they get a little extra benefit, most are the ones with an income of EUR 1,001-1,500 (22 percent), followed by 21 percent of consumers with incomes over EUR 2,500 that would change the product/service any time. 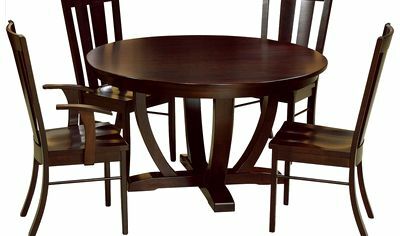 “The study considers the internal and external factors that influence the current consumer behaviors. The external factors considered are the demographic and socio-economic ones. The internal factors refer to features and behaviors that include attitudes, perceptions of motivation, and self-image of consumers. A consequence of the answers received, the study distinguishes two types of aspects related to purchasing behaviors. Some refer to delivery time, price, availability, and the others relate to brand, personalization, and company policies. The study goes through the stages of a buying process from search and selection of information to post-purchase behaviors. That is why it is a valuable reference for the Romanian companies and a necessary source for strategic decisions”, says Constantin Magdalina, Emerging Trends & Technologies Expert, co-author of this survey. This study examines the purchasing behavior of consumers in Romania. The questionnaire, which received 1,960 answers, was applied between 3 July 2018 and 28 September 2018. The answers to the CAWI questionnaire (computer assisted web interview) comprise 1 percent respondents aged 18-24 years, 20 percent aged 25-34 years, 37 percent aged 35-44 years, 28 percent aged 45-54 years, and 14 percent aged over 55 years. Of the respondents, 8 percent have monthly incomes of EUR 0-500, 25 percent have revenues of EUR 501-1,000, 23 percent of EUR 1,001-1,500, 23 percent of EUR 1,501-2,500 and 21 percent of over EUR 2,500 per month. 73 percent of respondents live in the urban area, while 27 percent are from the rural area; 46 percent are male and 54 percent female. The main source of information for 84 percent of consumers comes from the online environment, but 52 percent count on the opinions and recommendations of friends and family. The shop consultant is a source of information used by only 3 out of 10 consumers, and specialized advertisements are used as a source of information about the services or products desired by 24 percent of consumers. Press and television are sources of information for 22 percent of buyers. So, ads produce emotional buying reasons, not being regarded as sources of information. 46 percent of respondents say that online information has been useful when looking for products or services over the past year, 19 percent consider the information to be only satisfactory, 15 percent say it was less useful, and 3 percent consider that information from the online environment was completely useless. TV ads are only third in terms of respondents’ perception of the type of advertising that influences them to purchase the desired product or service – only 24 percent have chosen this option. The advertisements on the websites chosen by 56 percent of the respondents are ranked first, while the advertisements on social networks, selected by 47 percent of the respondents, are second. Advertisements in magazines and print media were chosen by 19 percent of respondents, and commercials broadcast on the radio by 11 percent. In Romania, the price of marketed products and/or services is the most important factor influencing the purchasing decision for 54 percent of Romanian consumers. The brand comes second, with 15 percent of respondents. Another 15 percent of the respondents are influenced mostly by the technical characteristics. Quality and terms of guarantee are appreciated by 9 percent of consumers, while the availability of the product/services and the delivery terms are appreciated by only 6 percent. Price importance percentages range from 85 percent for cars, 82 percent for mobile and internet and 80 percent for footwear or clothing, up to 63 percent for food and 58 percent for healthcare. The payment method is most important for bank loans (17 percent) and for insurance products (16 percent), and delivery to medical services (31 percent) and food (29 percent). On the other hand, for 74 percent of the consumers the purchasing decision is most strongly influenced by the information presented for the desired products/services, followed by 72 percent who are mostly influenced by the delivery terms, and the 68 percent mostly influenced by the warranty terms and conditions. Promotional offers influence the decision to buy of 6 out of 10 consumers. The products that Romanian consumers have bought the most through the online environment in the last 12 months are the following: electronic and home appliances (81 percent), clothing and footwear (71 percent) and mobile/Internet services (40 percent). Most consumers with over EUR 2,500 income (74 percent) bought online clothing and footwear, 90 percent of those with income of EUR 1,501-2,500 bought electronics and home appliances, 31 percent of those with income of EUR 1,001-1,500 bought online insurance and 10 percent of those with income of 501-1,000 euros accessed medical services in this way. The products that Romanian consumers bought the most in the store or the offline environment in the last 12 months are the following: food (94 percent), clothing and footwear (84 percent) and electronics and home appliances (40 percent). Mobile telephony services are bought offline by 37 percent of the consumers with over EUR 2,500 income, bank loans by 21 percent of those with income of EUR 1,501-2,500, insurance by 26 percent of those with income of EUR 1,001-1,500, and medical services by 34 percent of the consumers with income of EUR 501-1,000 and 34 percent of those with incomes over EUR 2,500. The responses to this study show that 48 percent of consumers say they would be willing to pay more for digital services that saved their time and offered them a very good buying experience. If 65 percent of respondents say they are willing to pay 5 -10 percent more for such digital services, 24 percent are willing to pay 10-15 percent more, and 11 percent with 15 -25 percent more. For 31 percent of respondents, warranty coverage is the most important for the post-purchase experience, followed by customer support (31 percent) and technical assistance (25 percent). For 44 percent of consumers with over EUR 2,500 monthly income the warranty assistance counts the most in the post-purchase experience, 37 percent of consumers with monthly income of EUR 1,501-2,500 appreciate customer support services, same as 33 percent of consumers with income EUR 1,001-1,500. 4 out of 10 consumers think the impact of the feedback they send on the website to companies that offer them products or services is a good one, 3 out of 10 think it is only satisfactory, and almost 2 out of 10 find this impact unsatisfactory. On the other hand, 51 percent of respondents say that feedback sent through social media platforms is a good mechanism to discover and validate information in an objective manner, while 25 percent say it is a new method to express dissatisfaction. Only 10 percent of respondents believe that this feedback cannot replace direct interaction with the consumer, and 7 percent have a high risk of data abuse. “This new study by Valoria reveals, mainly to businesses with online presence, what matters to consumers in Romania at every stage of the purchasing process. It is a useful guide for those who are still not operating in the online environment and who emphasize the advantages of being in this environment. The major quality of this study is the understanding of the motivations that underpin the purchasing behavior of consumers in Romania. The study correlates consumers’ income levels with information, loyalty, purchasing decisions and payment methods, the importance of the rating scores, the feedback, or the features they would pay more for,” says Elena Badea, managing director of the consulting firm Valoria, co-author of the research.